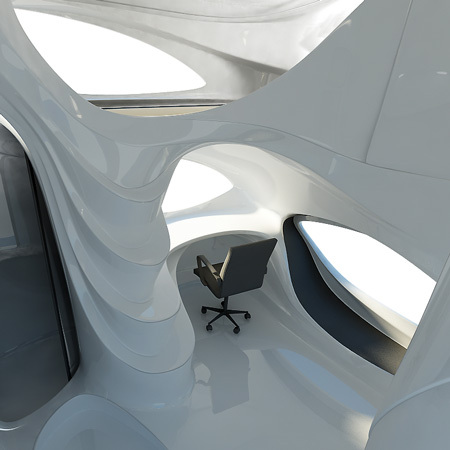 Austrian designer Christian Precht has designed a compact living environment called OrganiCube. The conceptual nine square metre apartment is made of Corian and comprises facilities for living, sleeping, working and bathing. OrganiCube explores the creative potential of the material world on the one hand and a study of living in a limited space on the other hand. Living on a small ground floor things have to get shifted to achieve the largest possible shell. It is an alternate look of an income-appropriate living unit of 3x3x3 meter. The idea is to take facilities that belong to living and to its tradition inherently and transform it into a coherent design. Through its cubic shape, the OrganiCube can be easily stacked and implemented in many environments. The infinitive space is conceived as a technological double skin, mainly manufactured out of DuPont's Corian. The design shows what the abilities of material in the future are: fluid, dynamic and curvilinear in one complex shape, which includes all needs for modern living. Therefore the organizational and formal structure is based on functional elements. OrganiCube defines a new architectural condition outside the orthogonal, off-grid and harmonic inside. Getting all the facilities on a ground floor of 9sqm, functional elements have to be compact and compressed. Through compression things get folded.These foldings are a functional element as well and the Cube provides a high standard of accommodation for one or two people, defining main facilities: living/sleeping/working and a separate bathroom. At one place a line shapes for example the wardrobe and a few steps further it flows into a completely different living setup. All featured curves have their distinctive function and purpose. Through this moving and fluid interior the cube should bring harmony to residents in a sensual way.